A proposal that the embattled National Chairman of Peoples Democratic Party, PDP, Senator Ali Modu Sheriff, sign an undertaking not to contest the 2019 presidential ticket in 2018 threw a meeting of the party’s National Assembly members into an uproar yesterday. The lawmakers, at the end of the meeting, remained divided over the candidature of Sheriff for the office of National Chairman and constituted a committee to resolve differences within 24 hours. 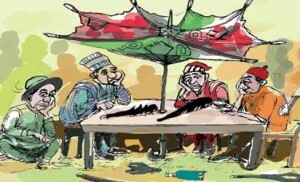 Instead of having Sheriff as the single candidate for the position of National Chairman, a sizeable proportion of the PDP lawmakers sought for the contest to be made open to all. The meeting, which started at about 4p.m., ended at 6p.m. in Hearing Room 0.28 of the House of Representatives wing. The stalemate ensued when it was proposed by the anti-Sheriff lawmakers that whoever submits to contest for the office of National Chairman should sign an undertaking not to contest the presidential primaries of the party for the 2019 election. Following the stalemate, the caucus constituted a 12-man reconciliatory and congresses committee to meet with the National Working Committee, NWC, and the governors to find a lasting solution to the problems ahead of the convention. A source told Vanguard that the reconciliation committee has six members each from the Senate and House of Representatives, respectively. Among those from the Senate are Senators Danjuma La’ah, Kaduna South; Biodun Olujimi, Ekiti South; Enyinnaya Abaribe, Abia South; Ogola Foster, Bayelsa West. From the House are Tajudeen Yusuf, Kogi; Sunday Karimi, Wole Oke, among others.